Last week I wrote about our struggles with dinner, but this week I write about our triumphs! 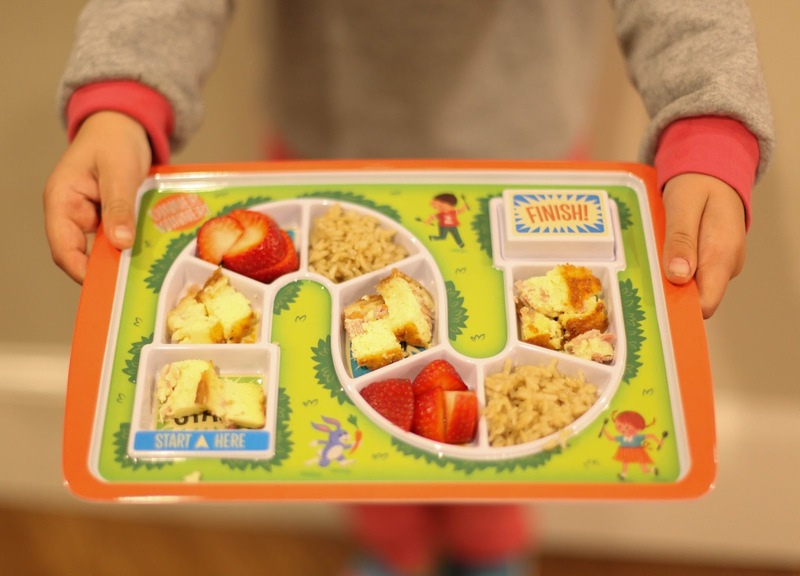 A friend read my post Picky, Picky, Picky Eater and immediately informed me of this amazing product that has changed dinner time in their house, the Dinner Winner Tray by Fred & Friends. I am willing to try anything with my kids, so I hastily purchased two trays via Amazon as I could not go another night fighting my kids to eat their dinner. The kids were immediately drawn to their colorful new "plates" and I loved the retro design and feel. I let them both see the trays before I started to prepare dinner, and told them we were going to play a little game while we ate. Mommy was going to put a treat under the "Finish" top and if they ate their way down the path and got to the Finish space, they could have whatever I put under there. I had them in the palm of my hands. Games? Prizes? Mom is actually letting us have dessert??? I explained to them that some nights the spaces on the trays would be filled with things that they don't eat all the time, and that they had to try them. I also explained that if they didn't eat all (ok, 90%) of the food on their tray that they wouldn't get the AMAZING prize (which has been M&Ms the past four nights), and that is ok.
Let me tell you this - for four nights in a row my kids have been asking to play "Dinner Winner" and are absolutely elated when they sit down to eat!! I got them both to eat the crap out of a ham and cheese quiche, they are eating their vegetables, and last night I even got Marlo to eat "weird" pizza that had fresh herbs on it. I am still in shock. They have been so good at waiting to have their prize too. And totally understand that if they don't eat the food in the spaces they don't get the prize, as has happened for each of them one night. I know there are articles out there that tell you not to bribe your kids to eat, and not to make them eat all their food, etc., but we tried those methods. I tried the "You don't have to eat all of it" method or the "try bite" method, but nothing worked. The kids ended up just walking away from dinner and then throwing huge fits at bedtime because they were so damn hungry. This might not be the best way to get them to eat, but for four days it has worked for us!!! I wish they made this for adults, but instead of a food prize it was a pill you could take to lose 10 pounds! La Fondation SCP utilise pour cela une licence spcifique : la Licence Attribution Partage dans les Mmes Conditions 3.0. N'importe lequel des travaux drivs de la Fondation SCP doit tre en retour rattach sa source originale. Si vous utilisez un objet SCP ou un conte spcifique, vous devez citer l'article et le Wiki de la Fondation SCP. (A comprehensive timeline later detailed the amount of time it took for the first rescue vehicle to arrive, how long it took to get her out of the demolished car, stabilize her in the ambulance, get her to the hospital with the superior trauma team as opposed to the closer hospital, and so on. )A top cardiovascular surgeon operated drake shirts on the princess, but her internal injuries were too severe. hoodie shirt The doctor later said he couldn't believe she had survived even that long. "I think one of the hardest things to come to terms with is the fact that the people that chased her, through, into the tunnel, were the same people that were taking photographs of her while she was still dying in the backseat of the car," Harry, now 32, reminisces in Diana, 7 Days, a new documentary about the immediate aftermath of his mother's death. "And William and I know that, we've been told that numerous times, by people that know that was the case.